Organic synthesis is the study of how synthetic chemists make, in the lab, new materials or old natural products. An organic synthesis can involve one single step or multiple steps. Multi-steps synthesis requires the chemist to accomplish more than one reaction, in order to obtain the target product. Retrosynthesis can be defined as the approach of working out syntheses starting from the target molecule and working backwards toward simpler starting materials. Organic synthesis is the study of how we build, in the lab, molecules ranging from complex, biologically active to new material or old natural products. Synthetic chemistry allows chemists to construct entirely new structures, from simple, already known molecules. An organic chemist can build new molecules with wanted specific properties, (anticancer, painkiller and so on) or he/she can develop new, more efficient routes for constructing the complex molecules found in plants and nature in general. New and old catalysts, nanostructures, superconductive material, solar panel components, synthetic fibres and colourants are all synthesized (made) in organic chemistry labs. We can say that this type of synthesis requires the chemist to accomplish more than just one reaction in order to obtain the final product. These series of reactions are finalised to obtain a final target are called steps. Constructing the carbon skeleton or carbon chain of the desired molecule. Introducing, removing or transforming functional groups in a way that achieves the functionality (chemical, pharmacological, biological and so on) of the final product. Orienting the bonds and the functional groups in the molecule in a certain way. Some reaction takes place only if the molecules are oriented in a certain way in space. Chemists try to exercise selective stereocontrol at all stages and orient the bonds of a molecule in a certain and define position in the space. A successful synthesis must not only produce the desired product but also do so in a reasonable amount. This means it needs to be achieved which a high yield, which should be as high as possible. A synthesis with an overall yield of 0.1% does not make sense. On the other hand, a two or three-step sequence is usually better than a six or seven-step procedure, even if the individual step yields are better in the longer route. Remember that making a molecule can be quite expensive, as the lab, the equipment and the chemists themselves costs lots of money. Therefore, the shorter the synthesis, the better. It is also necessary to take into consideration the fact that most reactions do not proceed in 100% yield, and the losses are multiplied with each additional step. If numerous functional groups are present at intermediate stages, some of these may need protection from unwanted reactions. This reaction may be degradation or substitution of the functional group. To avoid this, the functional group requires its introduction and later removal, and such operations can add many steps to a synthesis. The starting compounds and reagents for a synthesis must be purchased, so economic considerations are often important when choosing the starting material of the whole synthesis. Chemists always try to recovery or recycling the starting material, so to avoid the cost of buying it over and over again. Useless by-products are always formed in the synthesis, the expense of their disposal can be a huge factor if these materials are toxic/harmful and safety special rules need to be observed. For a given target molecule, several different reaction sequences may serve to accomplish its synthesis. The researchers always try for new synthetic routes to known compounds, and alternative routes continue to be done and published continuously, particularly as new reactions are developed and applied to difficult transformations. Although we make the above list, these are not independent tasks to be done one by one but must be integrated and correlated in an overall plan. Thus, the assembly of the molecular framework will depend on the structure and functionality of available starting materials, the stereo or regioselectivity (orientation of bonds in the space) of the various reactions that may be used to stitch them together, and the loss or relocation of functional groups in the intermediate compounds formed on the way to the final product. Scheme 2. 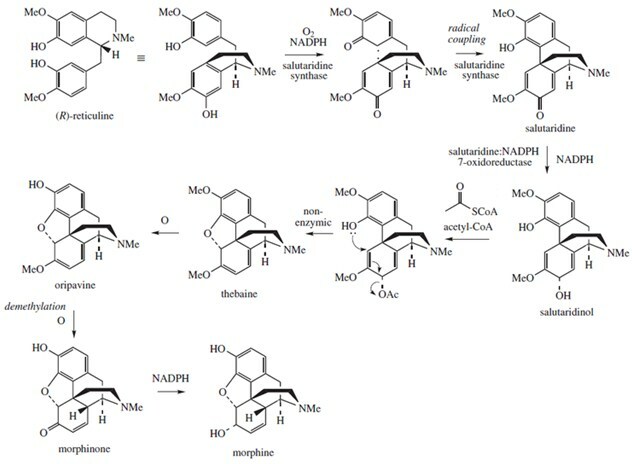 Synthesis of the morphine using (R)-reticuline as the starting material. 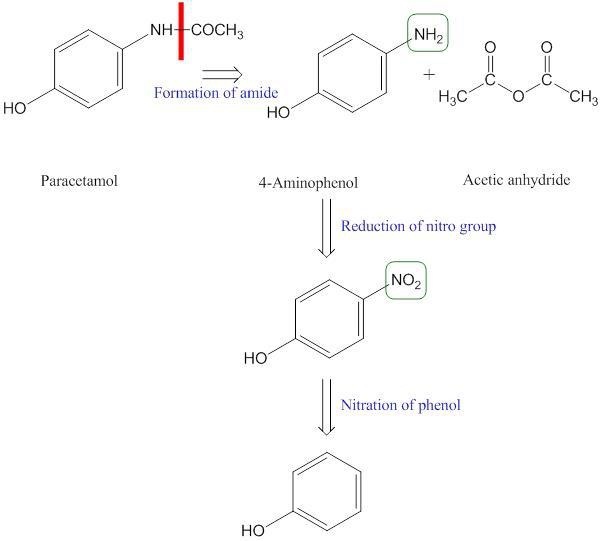 Note the complexity of this synthesis when compared with the aspirin one in scheme 1. This is a very useful approach at the initial stage of a synthesis: design an efficient synthetic route to obtain a compound. It involves working out syntheses starting from the target molecule and working backwards toward simpler starting materials. It is also named retrosynthetic analysis. In this procedure, the target molecule is broken down progressively into simpler structures by disconnecting selected bonds. Each simpler structure, so generated, becomes the starting point for further disconnections, leading to a branched set of interrelated intermediates. A retrosynthetic transform is depicted by the => symbol, as shown below. Once a complete analysis has been conducted, the desired synthesis may be carried out by application of the reactions underlying the transforms, and based on experimental data, can be changed or adjusted. Retrosynthetic analysis is especially useful when considering relatively complex molecules without starting material constraints (prize, availability, stability, toxicity).